Article Highlight: Where Can I Purchase Mushroom Compost for My Garden? Mulch works wonders in the garden. It helps prevent weeds, protect plants, and improve soil. The rewards are almost endless. Mulch is any material applied as a top layer over the soil. 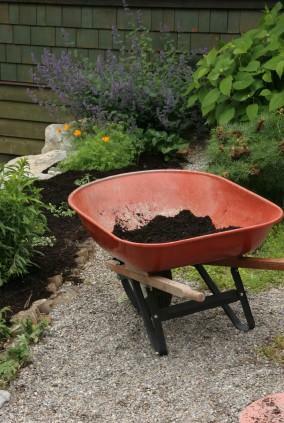 Mulching your garden will reduce the amount of time you spend weeding, watering, and fighting pests. It conserves water by slowing evaporation from the soil. It insulates soil, protecting plants from freezing in the winter or baking in the summer. A thick layer keeps weeds down by depriving them of air and light. Organic varieties enrich the soil as they break down. It keeps soil from washing away, which helps prevent erosion. It keeps the garden clean. It keeps dirt from splashing up onto plants' leaves. You can walk around a wet, covered garden without getting muddy. Many types look good. Gardens take on a finished look after they've been mulched. Bark or wood chips should be spread about 3 inches deep. Spread rocks or gravel 1 to 2 inches deep. When spreading, maintain a mulch-free area directly around plants or tree trunks to avoid smothering the plants. If you place it 2 inches deep, a 2-cubic-foot bag will cover 12 square feet; a 3-cubic-foot bag will cover 18 square feet; and a cubic yard will cover 167 square feet. If you place it 3 inches deep, a 2-cubic-foot bag will cover 8 square feet; a 3-cubic-foot bag will cover 12 square feet; and a cubic yard will cover 108 square feet. There are many types of mulch. They can be organic-derived from plants-or inorganic-created from man-made materials. Examples of organics include bark, wood chips, leaves, and compost. Organics nourish the soil as they decompose over time and need to be replenished. Rock and gravel are common inorganic, or artificial, types. Other examples include black plastic, rubber, and landscape fabric. These materials keep down weeds, trap heat, and conserve moisture, but do not nourish the soil. Winter mulch is applied in cold climates, after the ground freezes, to protect plants from damage caused by fluctuating temperatures. Leaves and straw are commonly used as winter versions.